Clio & Phineas: SOS: Save the Thimble! Ladies and gentlemen, the humble sewing thimble is under attack! OK, OK, not really. I'm referring to the thimble Monopoly token. Hasbro has decided that it's time to modernize Monopoly by giving one of the old tokens the axe and adding a new one. (See here.) It's like when Crayola decided to "pink slip" Raw Umber from the 64 crayon box. Or when M&M replaced the light brown M&M with blue. Am I being sentimental? I'm usually such a modernist. 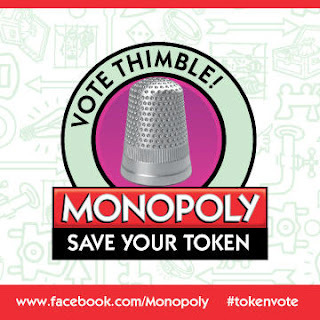 Let's save the thimble - it's a symbol of the craft that we all love. Some (non-sewists) might think it is quaint and old fashioned, but those of us who do any hand sewing know better. Facebook and Twitter users can vote for the token that they want to "get out of jail free". The token with the fewest votes will get the ol' heave ho!You can also vote on the new token. Vote here or at #tokenvote if you tweet. More Blogger woes: My comment problem seems to be ongoing. So, if you signed up for the Let Them Eat Cake! giveaway but don't see your comment posted, feel free to send me an email - clio[dot] phineas [at] gmail [dot] com - to confirm that you are "in". (Sarah Mayo, House of Pinheiro, Poppykettle, Kirsty, Amity Originals and Jennifer Churchill - you are all "in" even if your comments can't be seen here for whatever reason). Oh and there is still loads of time to enter! I voted to keep the thimble, I wanted to vote for the iron too. Agreed! The iron was one of my favorites, too! I am not okay with any of them going. Make it stop. Also, I don't use Facebook so I can't keep the iron or the thimble in play. Why can't we just have contemporary Monopoly with generationally relevant tokens and oldster Monopoly for people like me who'd just like people to get off our lawns? I always played the dog! From memory though, the thimble was always the last one left behind when my family played monopoly. Poor thimble!!!! It'll just make old editions of Monopoly more collectible if they change it! They are really choosing their audience by making it a FB and Twitter vote, aren't they? LOL. My siblings and I all had "our pieces" too. Oh no, really?? I'm not happy that any of them might go. Thanks for the heads-up! I was always the boot when we played. I blame that entirely for my mad love affair with shoes in my adulthood!